Today marks the official release day of Outlander season 2! I am so excited that the show is finally back on. Starz subscribers got to see it two days early so I ended up watching the first episode yesterday via the Starz add-on subscription to Amazon Prime. The episode was absolutely amazing! It starts out with a brief recap of the season finale of season 1. The opening credits were gorgeous as always. I just love the theme song. There is no doubt that I am a HUGE fan of the Outlander book series. I read the first book in December 2014 and have been collecting as many different editions as possible since then. When the show started I didn’t have cable so I had to wait until season 1 part 1 was released on blu-ray to watch it. I watched it over and over again. I just can’t get enough! 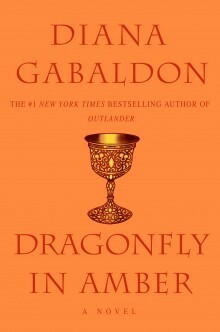 Season 2 is based on Dragonfly in Amber, book 2 of the series. While it hasn’t been my favorite of the series, there is a lot of awesome historical events involved. I don’t want to give away any spoilers for those of you that haven’t watched or read the books. Here is my beautiful collection of Dragonfly in Amber editions so far. I used to have the entire series in the US mass market editions but I decided to give those to my bestie who also loves Outlander but didn’t have her own set of the books. I am in love with my entire Outlander collection. Someday I hope to have a better way of displaying it but for now it works just fine! I have most of the older editions and the new tie-in editions on the top shelf along with things that go along with the show. On the second shelf I have the US trade paperbacks and the start of the US hardcovers as well as the Outlandish Companions, the Outlander coloring book, signed copies of Easton Press editions of Outlander and Written In My Own Heart’s Blood (book 8) and the Lord John Grey series which is a side story in the Outlander universe. My most recent acquisitions for the shelf are the awesome items that were in The Outlander Box from The Bookish Box! It was one of their one time box deals dedicated solely to Outlander. They have reopened sales now for what I assume is a limited time offer so if you missed out on the first round, you better get it now! Have you read the Outlander series? Have you watched the show? Goodreads Summary: DRAGONFLY IN AMBER is the second novel in the main OUTLANDER series. The book carries on the story begun in OUTLANDER, but begins with a brief framing story set in 1968, in which Claire Randall visits a young Oxford don named Roger MacKenzie in Inverness, in search of answers for her daughter, Brianna. Her request is unusual; she has a list of names, Jacobite soldiers who fought with Prince Charles Edward Stuart’s army, who took part in the disastrous battle at Culloden in 1746. What happened to these men, she asks, following the battle? Roger is surprised at her intensity, but intrigued at her question–and intrigued even more by her red-haired daughter. The answer to Roger’s search leads all three to an unexpected grave–and to a revelation that will turn all their lives inside-out. Claire tells Roger and Brianna what happened during the year before the Stuart Rising: the political intrigues, the chain of spying, betrayal, and murder that led her and her husband James Fraser from the court of Louis XV to the windswept moors of the Scottish Highlands and the blood-soaked ground of Culloden. The horrifying trap of circumstance and honor that sent her back to the future–and the present set of circumstances that have led her to her quest, and to a still more shocking revelation. Review: When I first started to read this book, I was kind of unsure of whether or not I was going to like it. I fell in love with the story of Claire and Jamie in Outlander so I was a little disappointed when the story started out back in the future with Claire and her daughter, Brianna. I just wanted to know where Jamie was and why was Claire back in the future. When the story finally went back (as Claire is telling her story to Brianna and Roger) I was so relieved! Jamie is my absolute favorite character so I was glad to see him again. It still took my awhile to get interested because their lives in France were SO incredibly different than in Scotland. If you are reading this book and wondering the same thing, hang in there! After awhile I began devouring this book. It kept getting better and better! I couldn’t wait until I had time to read every day. I found myself laughing out loud a few times, even tearing up a little bit. The second I got to the last word of the book, I immediately went to grab Voyager, the next book in the series even though I was planning on reading something else next. I just have to find out what happens next! If you haven’t yet read Outlander, do it! If you have but haven’t read Dragonfly In Amber, do it!